A Chinese garden is nothing like a European garden. There are no big open spaces covered by lawns,- straight lines are avoided,- there is no ocean of colourful flowers, - and I have never seen a fountain in a classical Chinese garden. 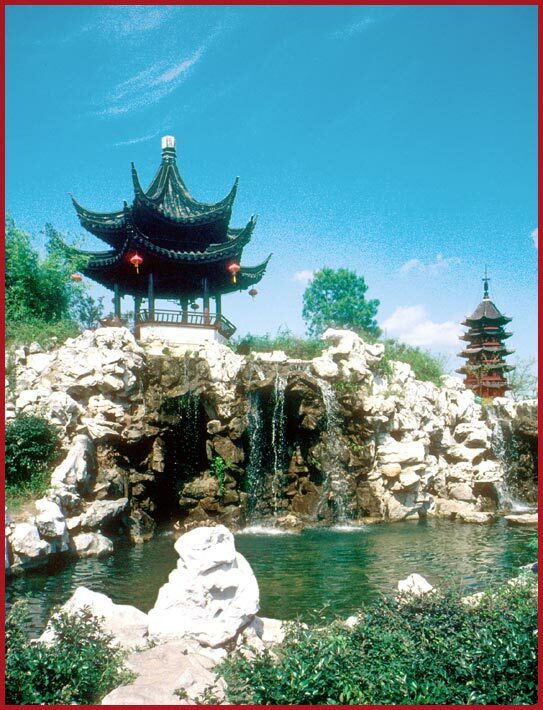 The idea of a Chinese garden is deeply rooted in the ancient Asian philosophies of Taoism and Buddhism,- in harmony,- in the balance of nature, - the yin & yang principle -, and always combining the elements of rock and water together. 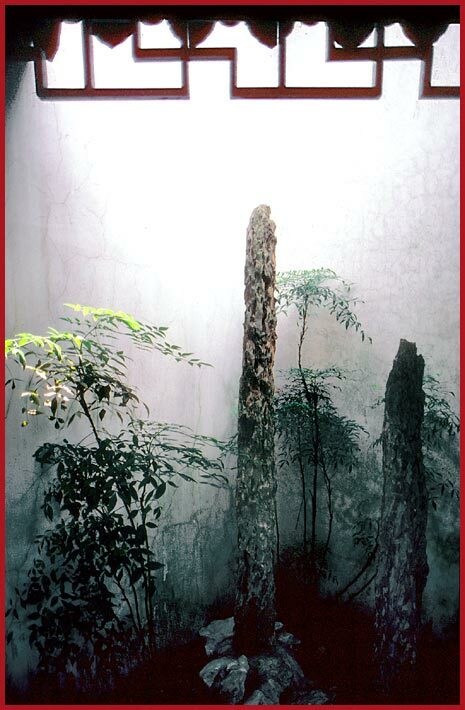 If there are no natural rock formations on the garden site,- you have to make it by yourself! Heavily eroded rocks are collected,- maybe from far away -, and built together to form miniature mountain ranges. Often a beautiful natural rock is carefully selected, and placed by itself as a treasured piece of art made by the greatest artist of all,- Mother Nature-, to whom we actually all belong! 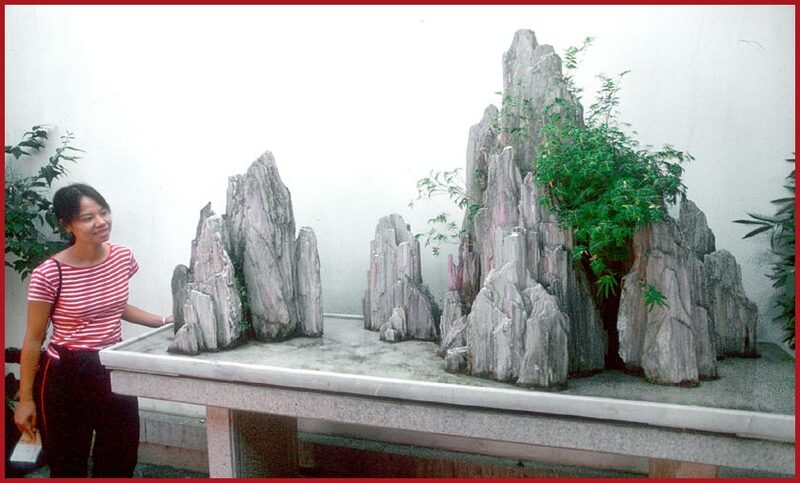 Here Kit Yu, - and miniature mountains in water, - like rocky islands -, displayed elevated on a table. As with rocks, - the same goes with water! If there is no natural lake, you make one,- often a lotus pond , of course with gold fish, and often combined with a small river,- complete with arched bridges, and maybe a small waterfall,- very often only dripping instead of actually falling! Strong colours are avoided,- the vegetation is mainly green, - very often with graceful bamboo placed in great harmony with the buildings and strategically placed pavilions where you can sit and meditate, - enjoy tea,- or entertain guests with intellectual conversations, - all in full harmony surrounded by a perfect "nature". All buildings seem to be connected with the garden in such a way, that often makes it impossible to decide where one stops and the other begins! House and garden seem to "flow" into each other,- and the effect is stunning! Very often are collections of skillfully made miniature trees displayed,- an old Chinese art, that surprisingly enough have been known to the rest of the World under the Japanese name "Bonsai"! All is connected by winding footpaths, covered by natural stones, which can be small or big,- or combined in patterns,- but all natural! At every turn of the footpath, new angles reveal new wonderful sights and impressions of great beauty and harmony! The Chinese have always loved walls, and have them around their houses, factories, palaces, offices, schools, - yes even a giant one around China itself! 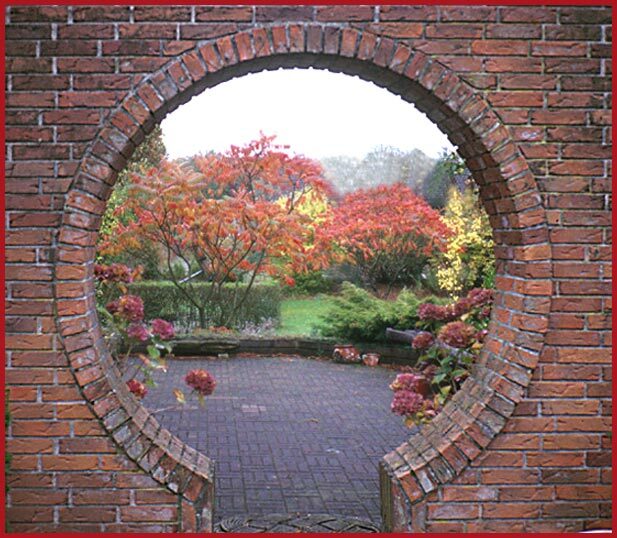 Of course also gardens must have walls around them,- but besides the outer walls there are inside walls as well, separating different sections of the garden from each other, and through those walls you pass through wonderful "Moon gates", which are round, but many other shapes and designs are used, - all beautiful. 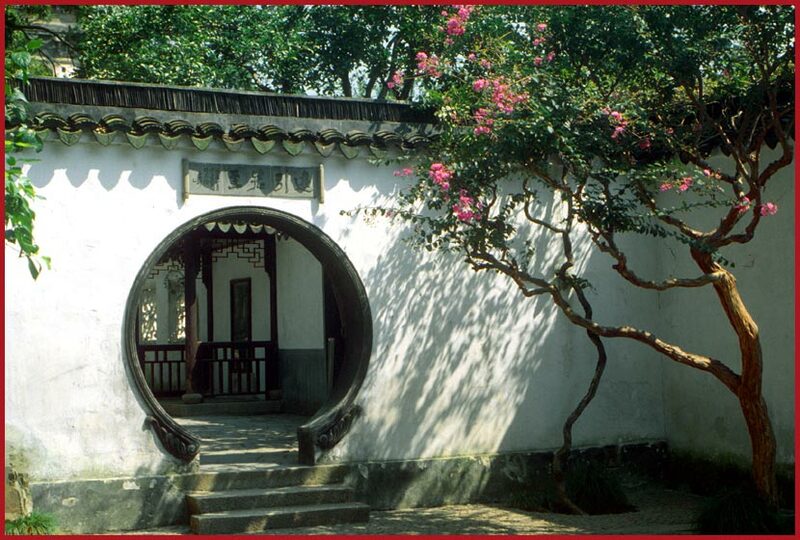 Here an internal garden wall with a typical "Moon gate" and a blooming tree in great harmony. Very often the gardens are very small and compact,- but due to the design and layout with "mountains", "lakes" and twisting and turning roads, they appear much bigger than they are! The Web Masters private "Moon gate" in Denmark, - in magnificent autumn colours. Way back in the seventies, - when I built my house -, I decided that I HAD to have a "Moon gate" too! Not in China, - but right here in my own garden in Denmark -, far, far away from the great culture that inspired it. 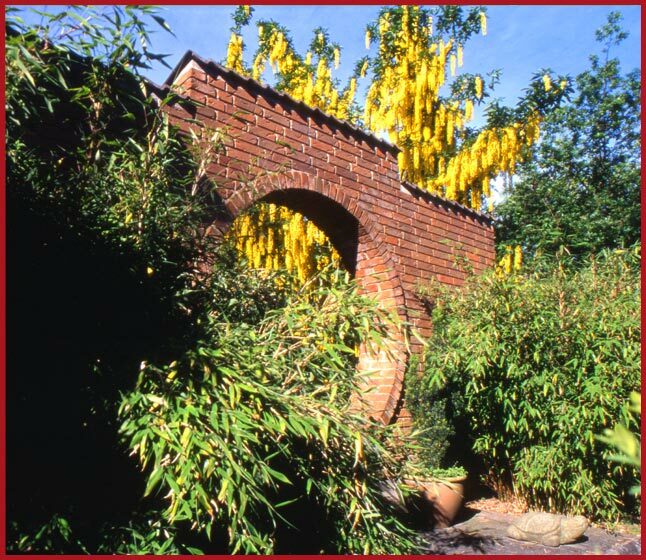 It could very well be the only "Moon gate" in Denmark, since I have not yet seen any other garden with this type of Chinese inspiration. Here another shot of my Danish "Moon gate" as it appears during summer time.